Tomorrow we leave the Denver area. I can’t believe it’s been 5 weeks already. We arrived on July 12th to check out the 26′ mid-bath Lazy Daze for sale in Aurora. I bopped around Aurora for a week, staying nights at a couple of Walmarts, while running errands and negotiating/completing the new RV purchase. Our last night in ole Myrtle was spent at Cherry Creek State Park, a full-hookup park. Bev and I had stayed there last August, right before she flew back to Austin. I knew I would need hookups to dump the tanks before moving into the new rig and storing the old. And, it was so hot I needed the electric to run the A/C. 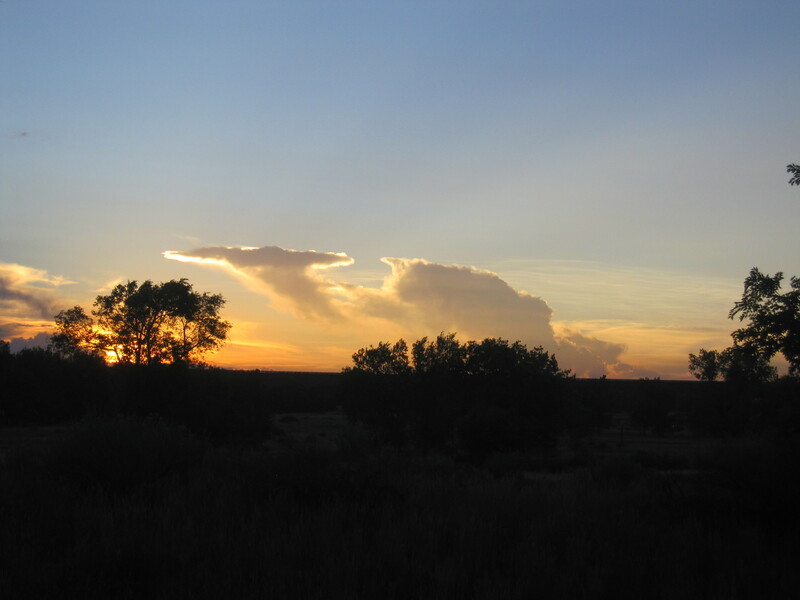 Is it just me or do these clouds look like the Starship Enterprise? 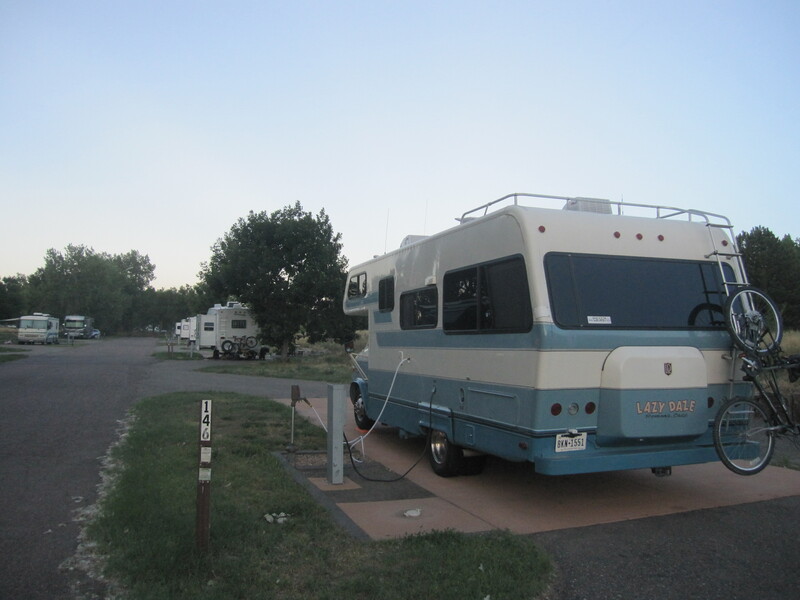 Also, during that time I worked on getting my old rig up for sale and managed to find an RV park where I could stay for a month in the new RV. Plus, I was able to find a secure storage spot for a month for the old rig. Lucky for me they were running a $1 move-in special, with no minimum time limit. I only had to pay a $23 administrative fee. So, I got an $85 monthly spot for $24. Score! I hoped one month would give me enough time to find a buyer for the old rig, get the new rig set up how I need it, choose/buy a scooter and take the class to get my motorcycle endorsement on my driver’s license. It was a lot to do in a month, but it all got done. The best part of the month was when Chris came for a visit and reserved a week at the same RV park. He helped me get the scooter and carrier, mounted the carrier on my hitch, devised a system to store the scooter ramp on my bumper, and drove me to the meeting with the buyer of the old rig, to the bank, etc. 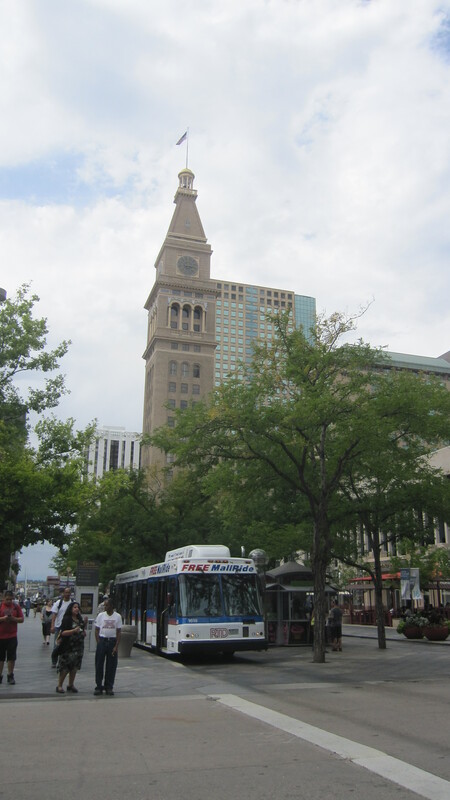 One day we rode the light rail from the Golden station near the RV park to Union Station downtown. It only takes about 40 minutes and avoids the hassle of driving, traffic and parking. There is a “Mall Ride” free bus system that picks up at Union Station and runs down 16th street, which is pedestrian only (except for the Mall Ride buses). The first stop was the Tattered Cover bookstore. We both like big bookstores with character and a coffee shop. It’s in a great renovated old building. 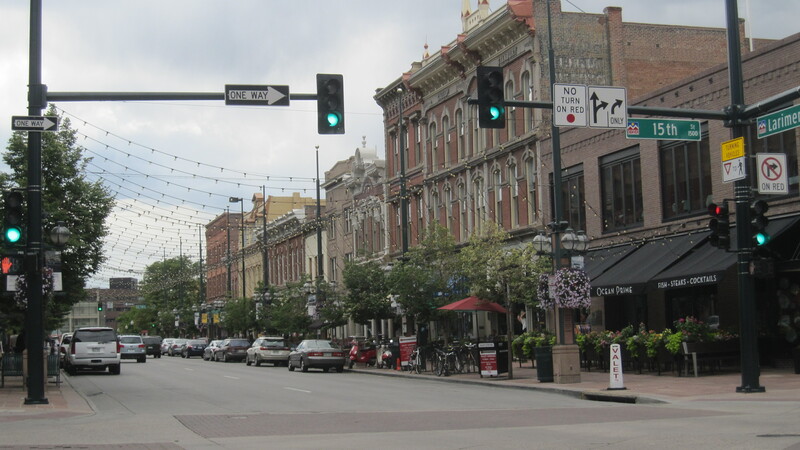 Larimer Street is supposed to be hip and trendy and the guide book said not to miss it. 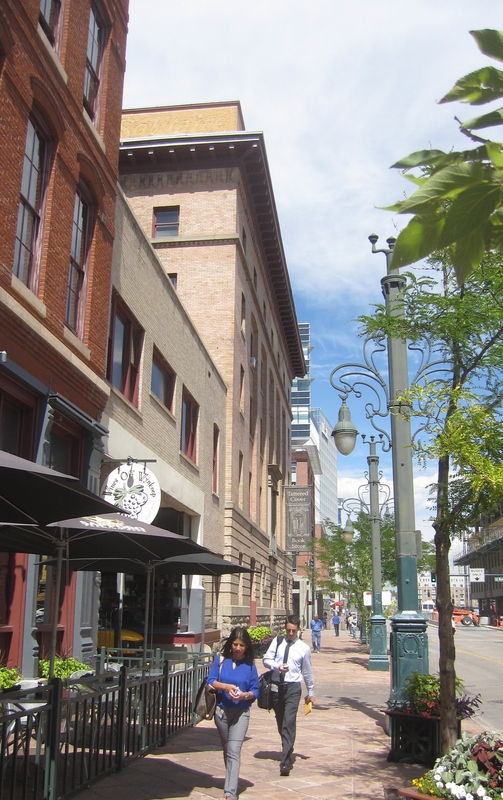 It has several restaurants with outdoor seating and some boutique stores. I bet it really comes alive at night. 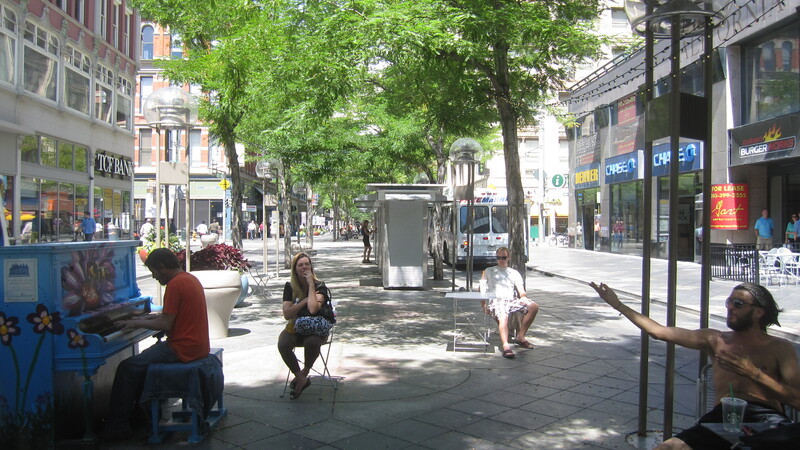 The middle of 16th Street has big trees, tables and chairs, vendor carts, and there are several pianos along the way. Folks are encouraged to make music. One guy was banging out a tune, and his friend was singing and really putting on a show. (At least I think it was his friend. Could have been some random dude just singing along.) I thought it was fun. Piano Man. His friend, on the right, was very entertaining. We had planned to eat at a food court that Chris remembered from a prior visit. We didn’t really see a restaurant there that we wanted to eat at, and back outside we ran into a guy passing out flyers for a lunch spot. 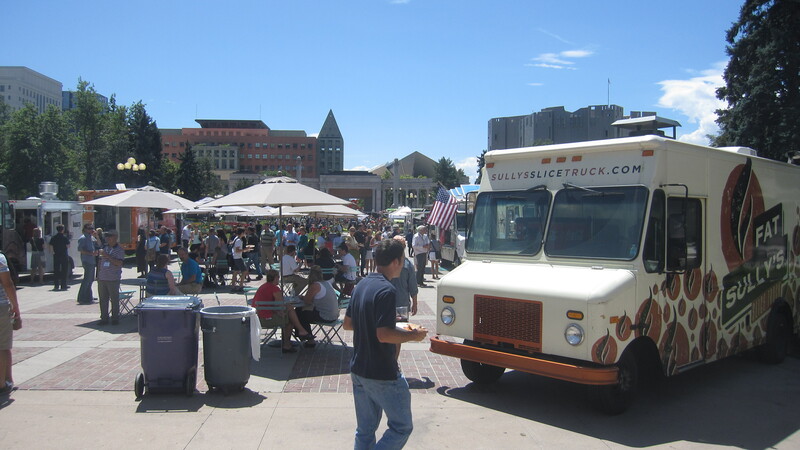 It was for a bunch of food carts that are set up in Civic Center Park every Tuesday and Thursday. Our lucky day – it was Tuesday! 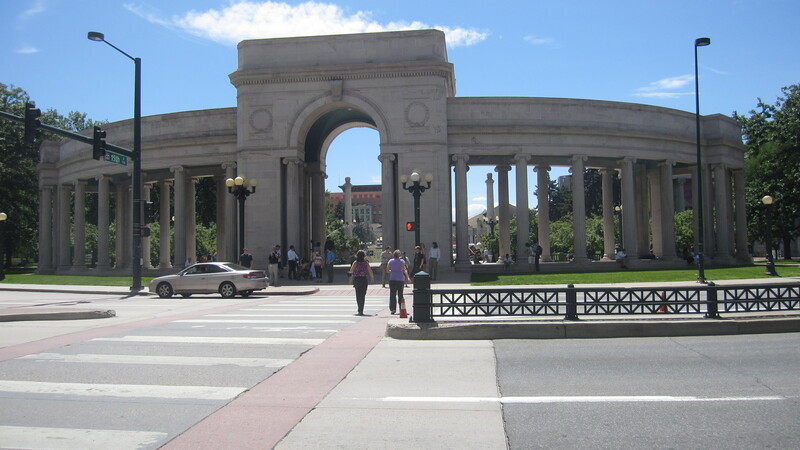 So we headed on to where the 16th St. mall ends, near Colfax and the Civic Center Park. It has a neat arch entrance from that side. Inside there were many, many food carts. It took a while to check them all out and decide where to eat. I finally decided on a salad from the Greek place. Chris had found us a site under an umbrella in the amphitheater area, and we ate there. Such a great lunch! Good food, lovely view, nice weather, great company, all-around fantastic! 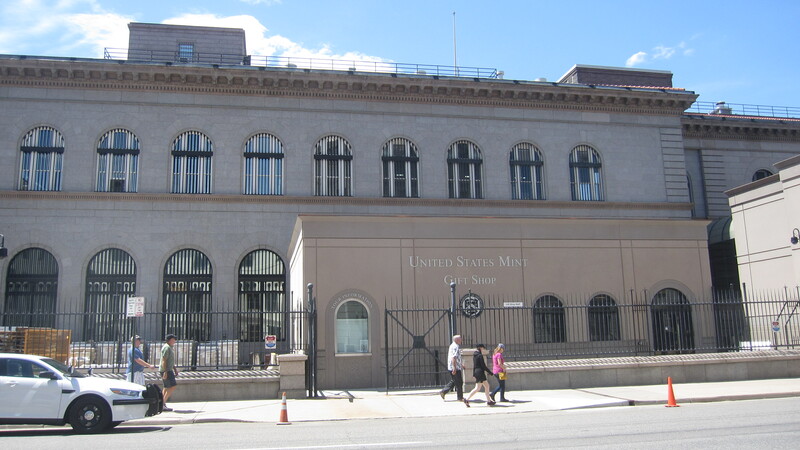 After lunch we headed to the US Mint. I had tried to sign us up for a tour, but they were booked up through mid-September. We visited the gift shop, then I checked to see if they had any cancellations. Maybe we could get in on the spot. Nope. Never hurts to ask! We headed back to 16th St. to walk back towards Union Station on the other side of the street. 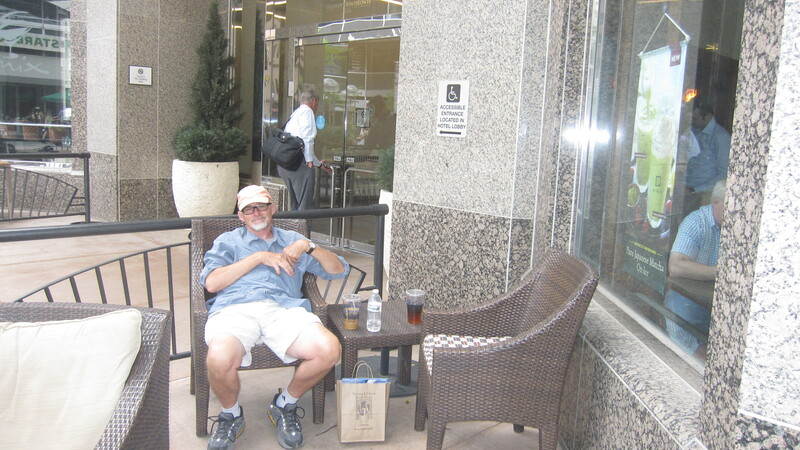 We stopped at Peet’s Coffee for a break and iced beverages. A little further up the road we visited the Federal Reserve Museum. (I’m a finance person, had to get a tour of one of the big monetary establishments while in town. 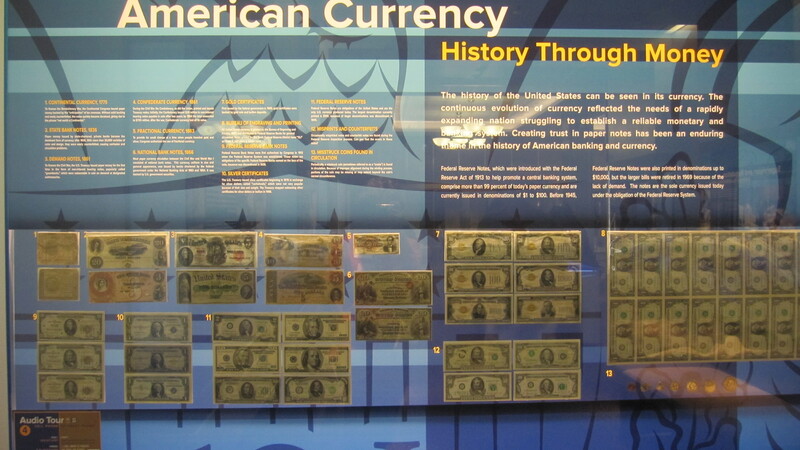 :-)) I really liked this history of currency. Also, there is a picture of 30 million dollars in the slide show at the end of the post. About 4:00 we got back on the train for the easy 40 minute ride back to the Golden station. I had dropped Riley off in the morning at the Rover’s Retreat doggie day care that’s right next to the RV park. They will also do a bath and brush, so he got that done, too. Spa day for Riley and I didn’t have to worry about it being hot in the RV or him needing to go potty. Perfect! It was great to have Chris here to help me and to do touristy stuff with. It’s very nice to have your boyfriend come down from fishing in the mountains for a visit when parked in Denver for a month! Tomorrow I head up to the mountains to join him again. We will be camping in a couple of areas between Hot Sulphur Springs and Steamboat Springs. Definitely will be cooler than Denver, where it’s been mid-80’s. With no shade on the tin can, my rig heats up into the 90’s during the day. I hate having to run the A/C. Looking forward to some cools. And to letting Riley run around off-leash a bit. And to meeting up with Chris again. 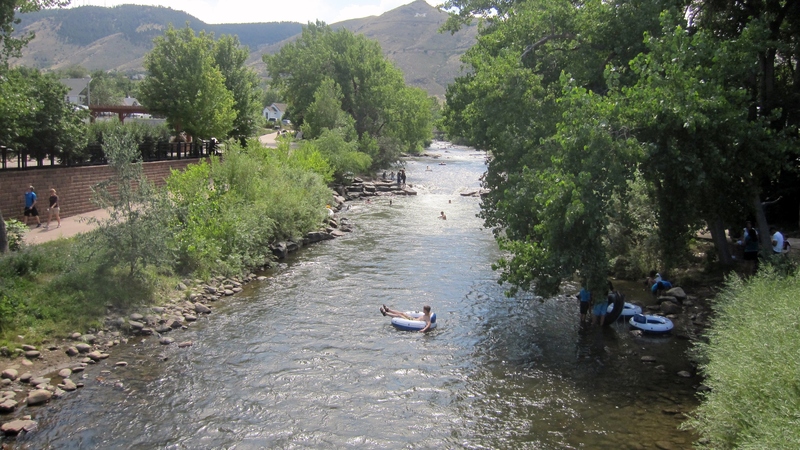 One more shot of Golden – tubers floating down Clear Creek in the middle of downtown. Neat little town they’ve got here. By the way, I hope to get a picture of my new RV posted to the top of my blog soon. Currently I have just the pictures I took in the Home Depot parking lot, and at the RV park where we’re packed in like sardines. I’d like to get a good shot like I have above now, of the old rig at Jackson Lake in Grand Teton National Park. 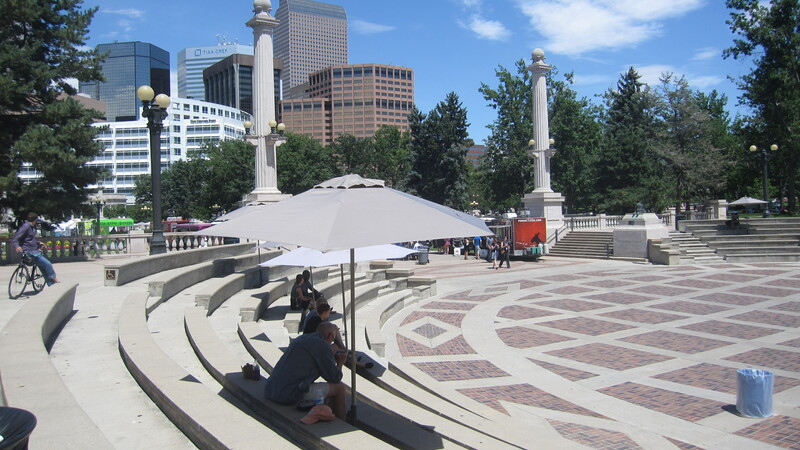 This entry was posted in Colorado, Lazy Daze and tagged 16th Street Mall, Cherry Creek State Park, Colorado, Downtown Denver, Golden by ontheroadwithriley. Bookmark the permalink. Jeanne, you make city touring look like loads of fun. I’m curious about the netting over Larimer street though. Is it really “netting”? Do you know what it’s for? Hi Lorna! They have strings of lights criss-crossing over the street, with big bulbs. It must look really festive at night. That was a nice tour of the city and surrounding area. Looks like a fun place to visit. Have fun further up and/or north! Hope you find perfect weather. Love the new rig.